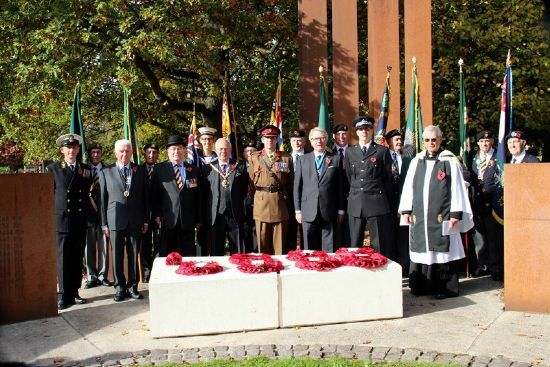 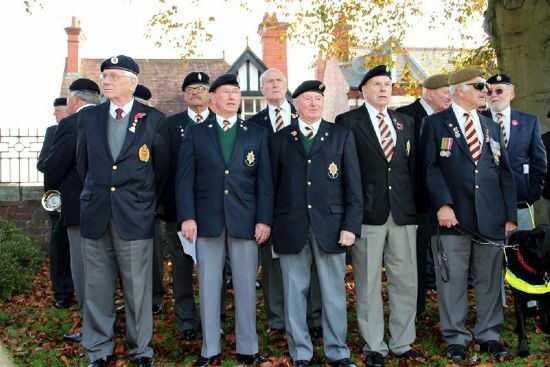 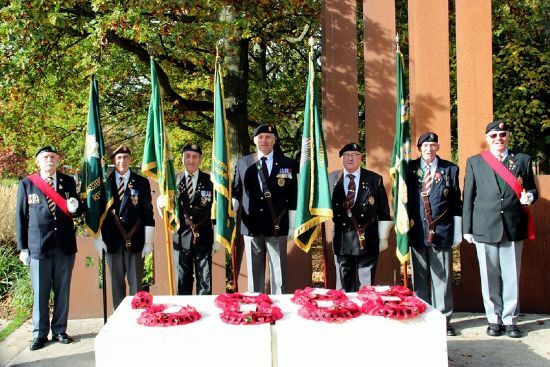 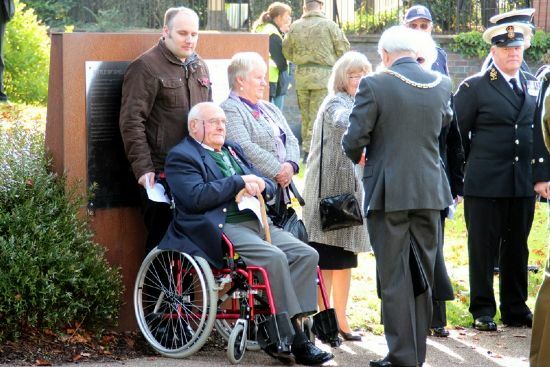 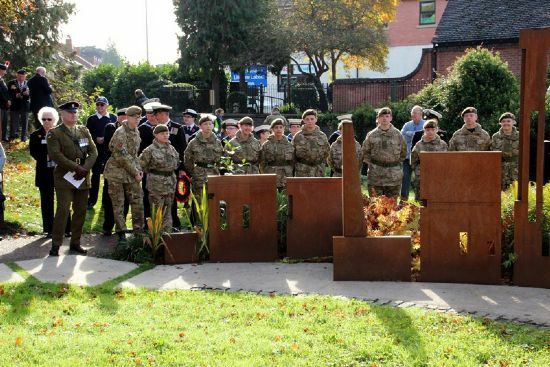 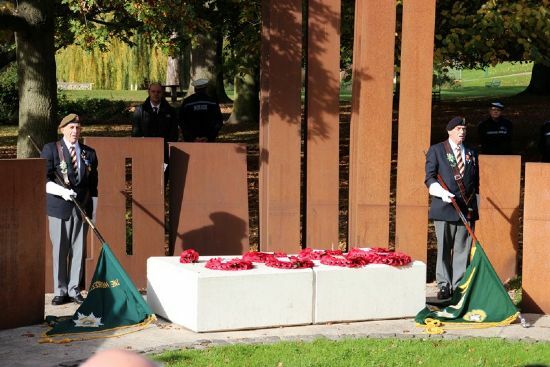 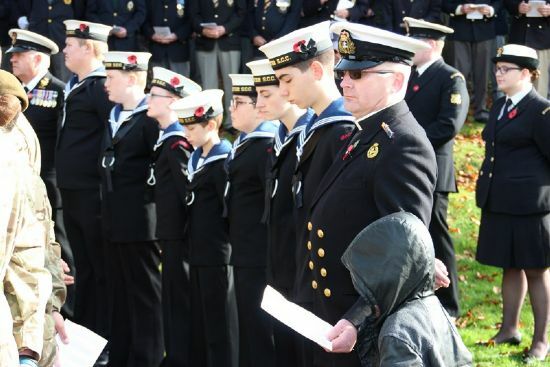 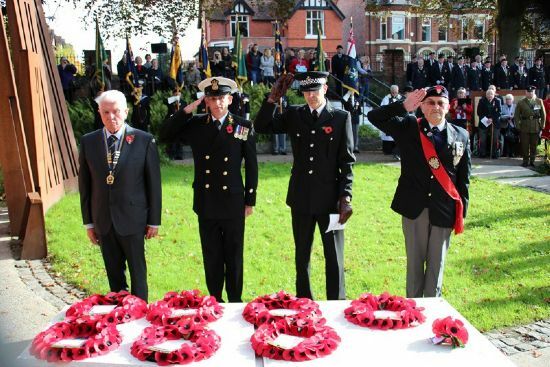 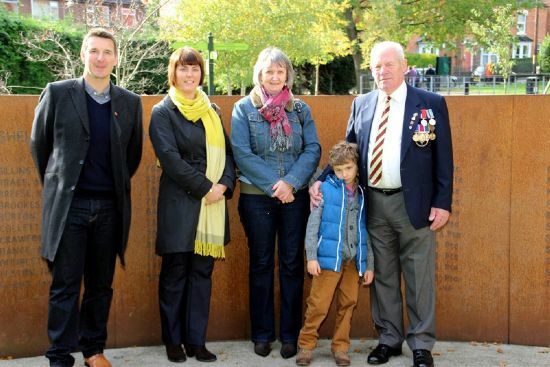 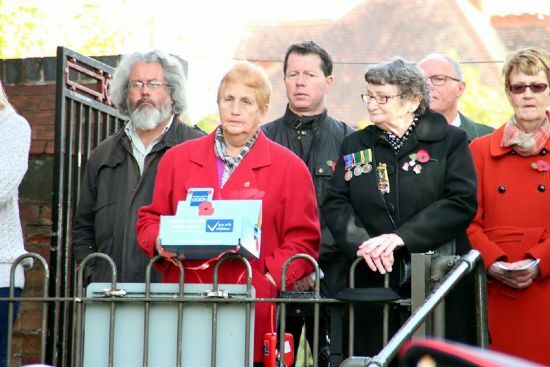 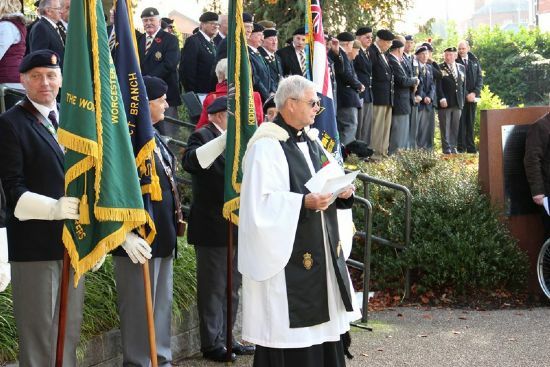 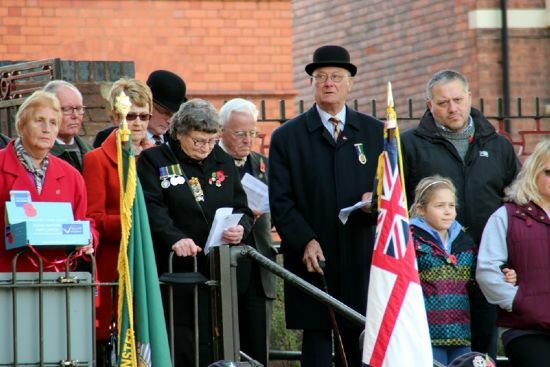 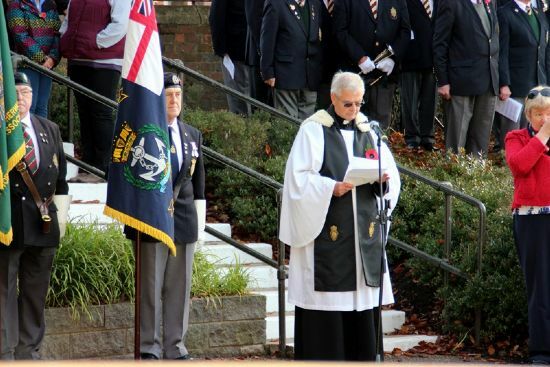 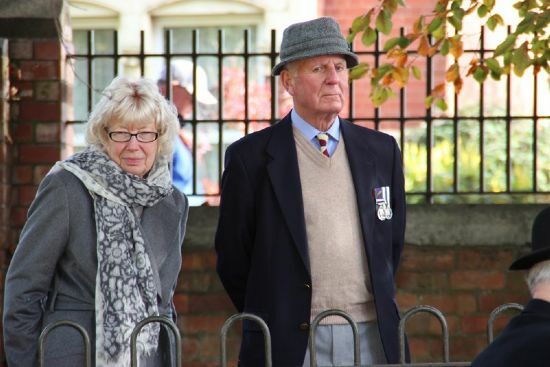 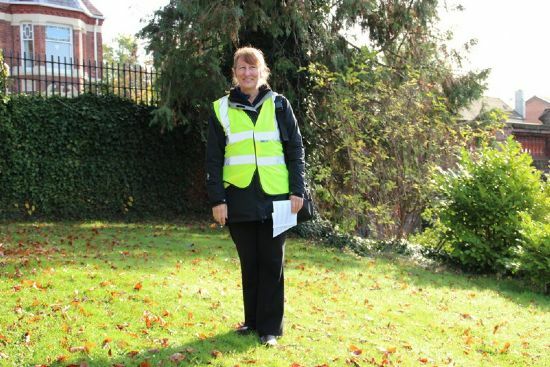 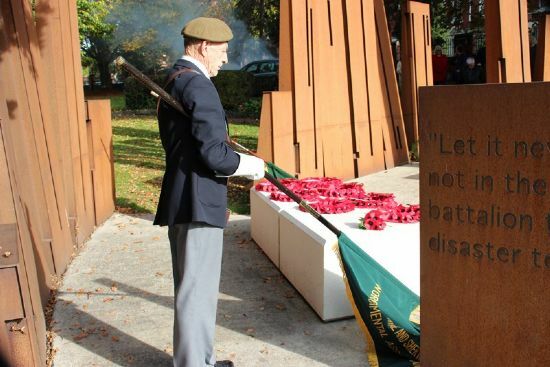 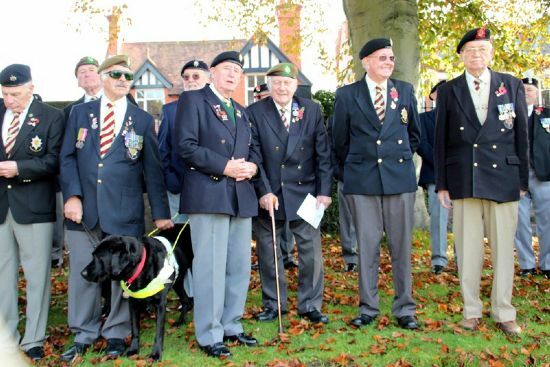 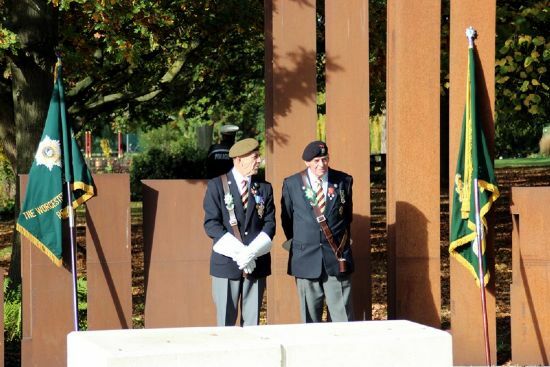 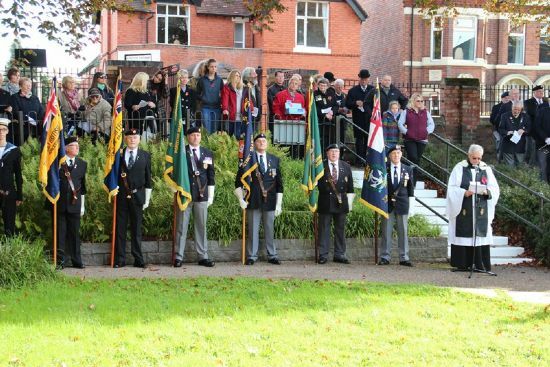 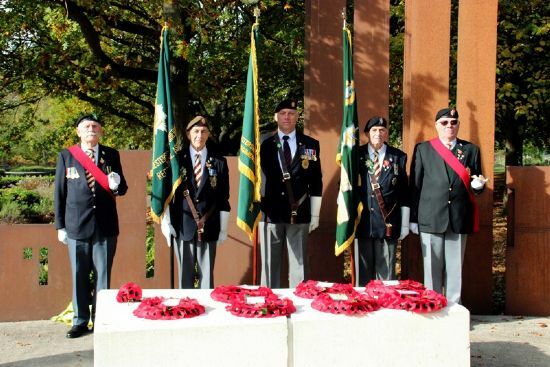 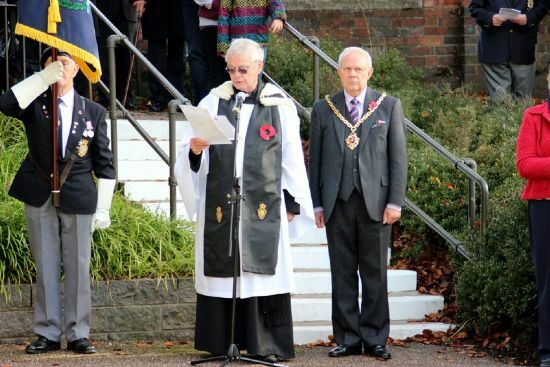 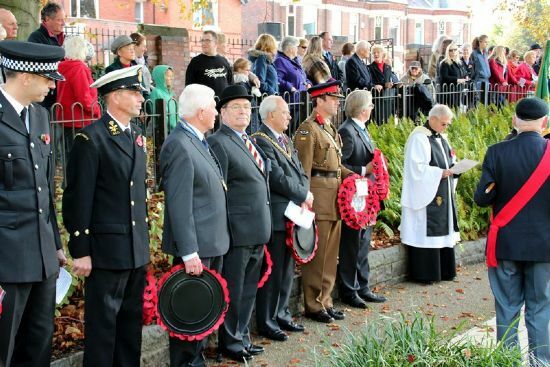 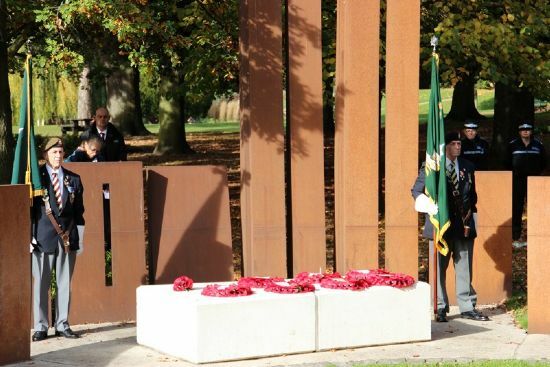 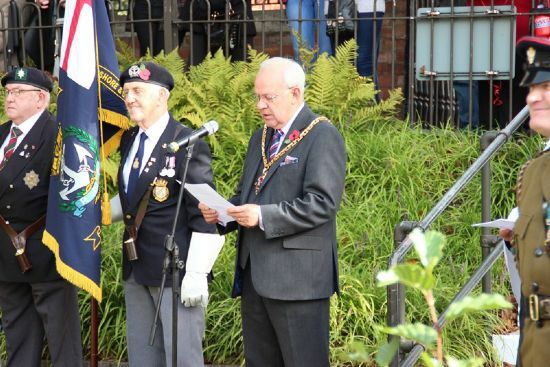 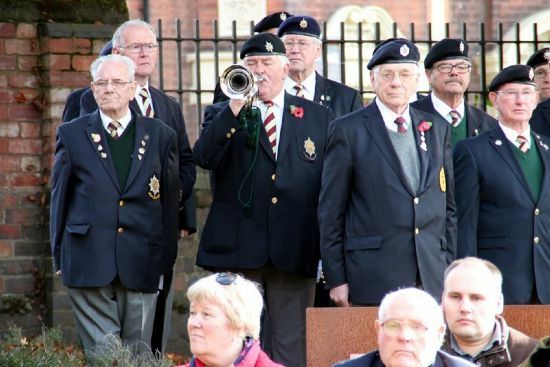 The 101st Anniversary of the Battle of Gheluvelt Commemoration Service was held in bright autumn sunshine. 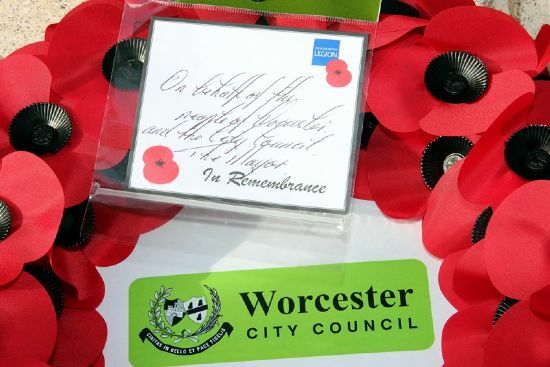 The Service was conducted by Canon Paul Tongue of Worcester with poppy wreaths laid by dignitaries, Services and ex Service personel in memory of the 187 casualties and men of the 2nd Battalion the Worcestershire Regiment. 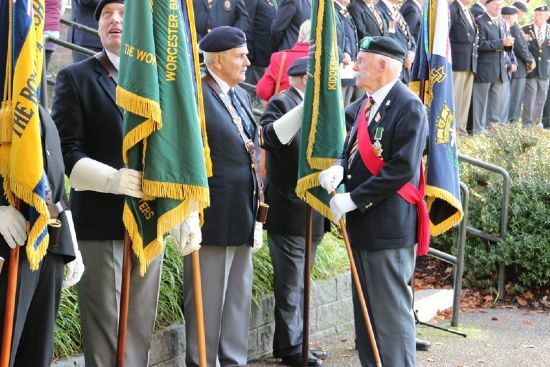 The Last Post Was played by Worcester Branch Bugler Mick Graham. 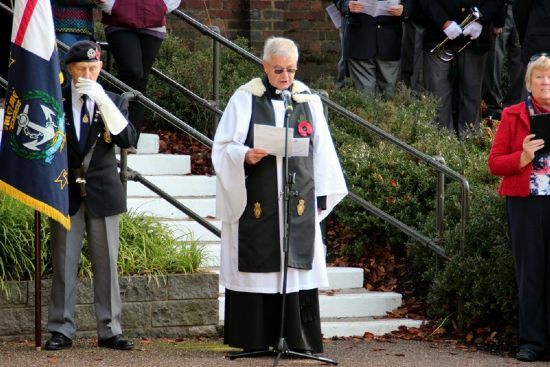 Two minutes silence was observed followed by Reveille with the Exhortation and Kohima Epitaph delivered by Canon paul Tongue. 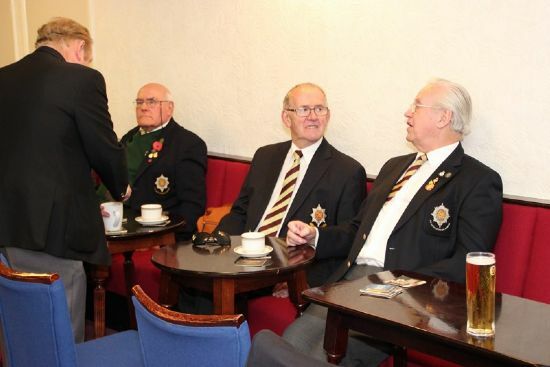 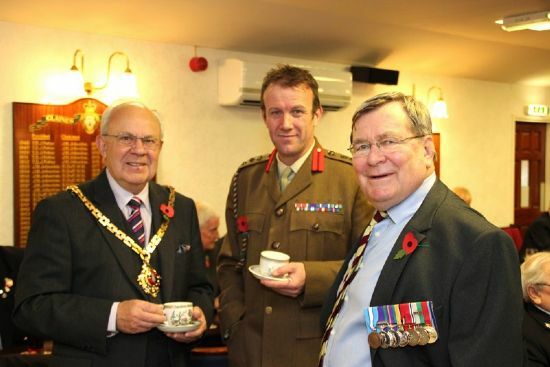 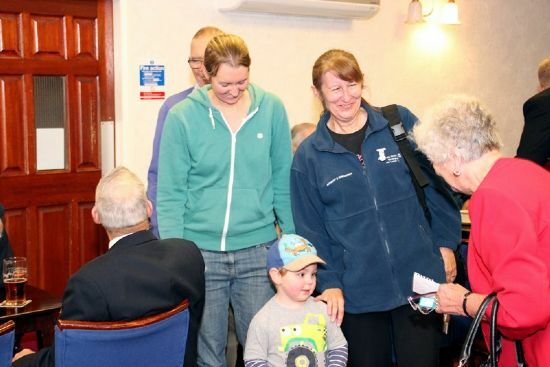 After the photocall at the end of the service, people gathered at the Claines Royal British Legion in Cornmeadow Road Worcester for lunch. 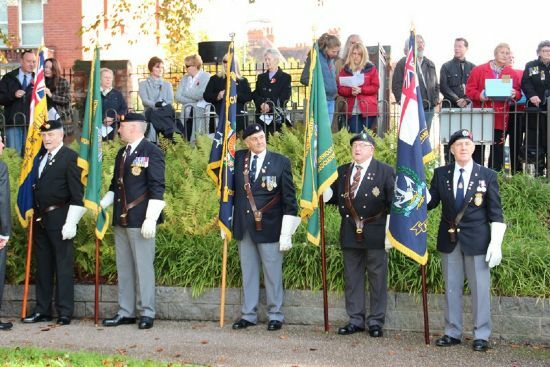 On October 31st in 1914, after 10 days of battle, nearly every unit had been drawn into the battle line and had been broken beyond recovery. 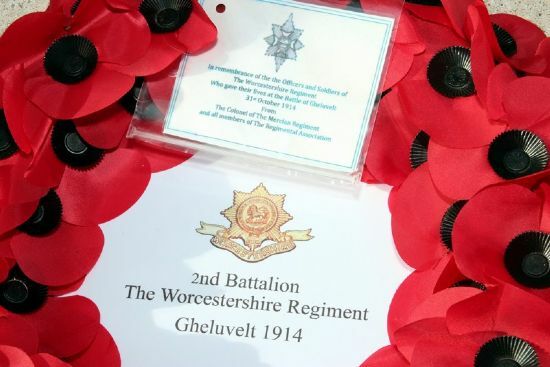 The 2nd Battalion The Worcestershire Regiment was the last available reserve of the British defence. 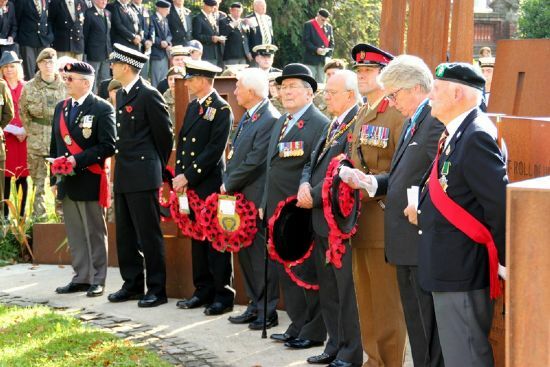 At 12.45pm A Company advanced to a railway embankment to prevent the enemy advancing up the Menin Road. 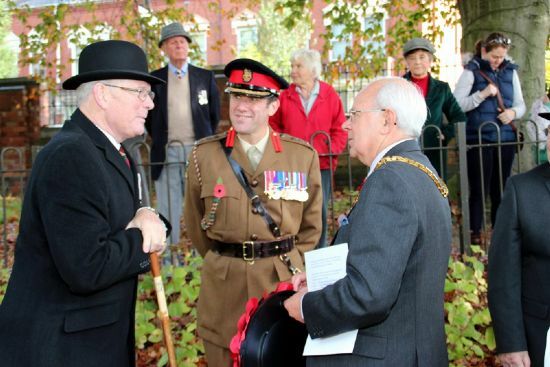 At 1pm, Major Hankey was given orders to counter attack. 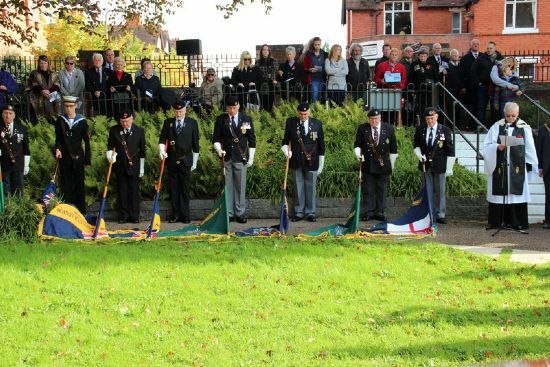 At 2pm with bayonets fixed, the Battalion moved off in file. 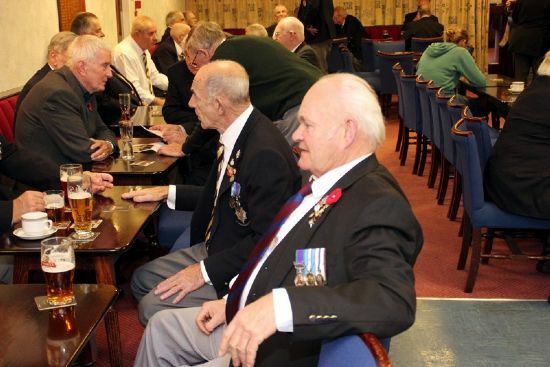 Everywhere there were signs of retreat. 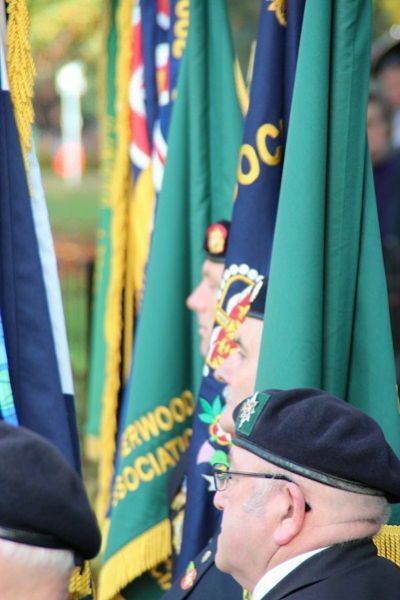 The Worcesters alone were moving towards the enemy. 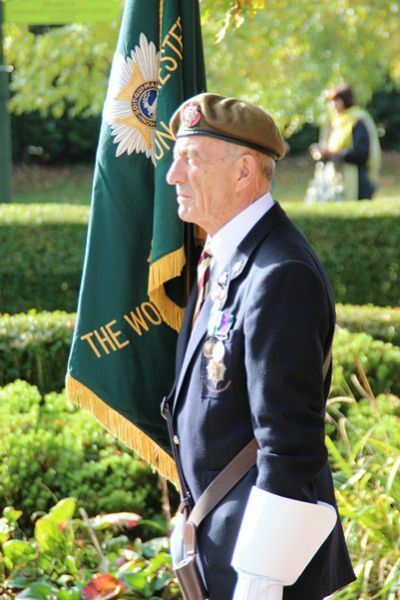 Three Companies B, C and D tramped grimly forward down into a valley, (the three Companies number 370 soldiers in total). 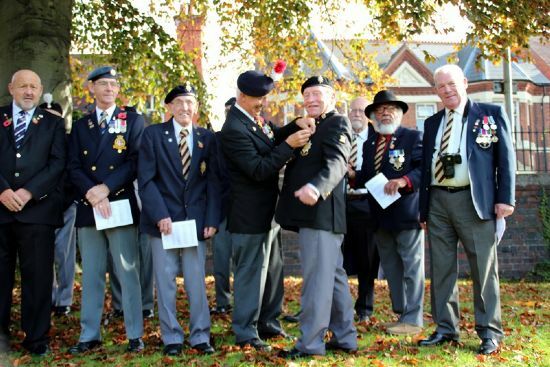 The two leading Companies broke into a steady double and swept forward – the officers leading and, behind them, their men with fixed bayonets in one long irregular line. 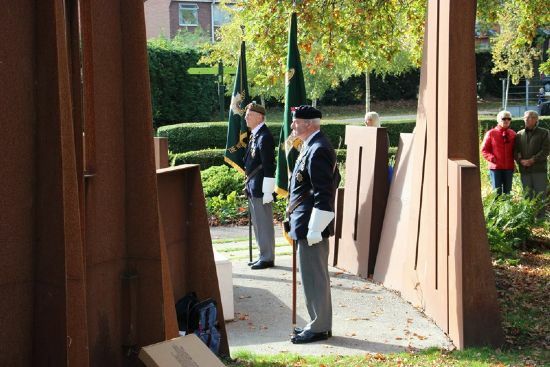 They scrambled across the light railway, through hedges and wire fences and then, in the grounds of Gheluvelt Chateau, they closed with the enemy. 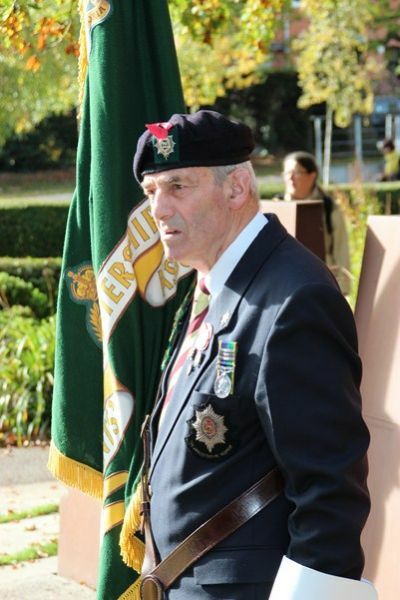 The South Wales Borderers had made a wonderful stand: all day, they held their ground at the Chateau. 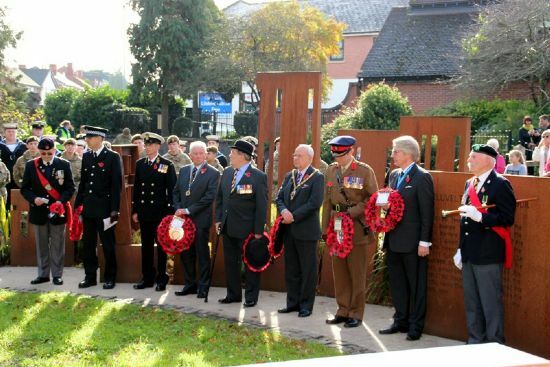 Their resistance had delayed and diverted the German advance and the success of the counter attack was largely due to their brave defence. 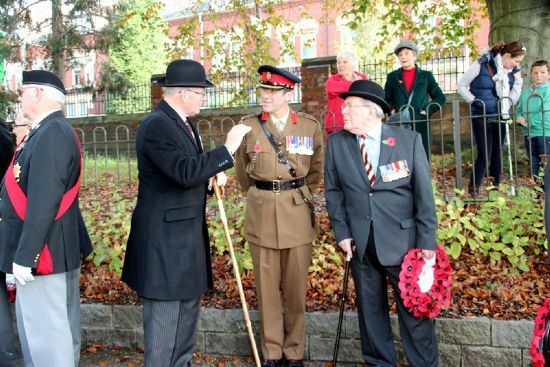 Major Hankey sent fighting patrols into the village to drive back snipers and to take some prisoners. 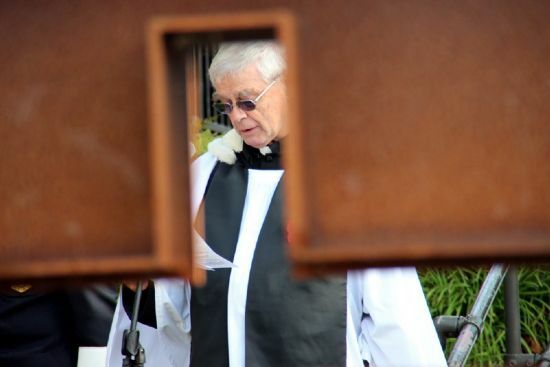 The village was secured but it was not possible to hold it permanently. 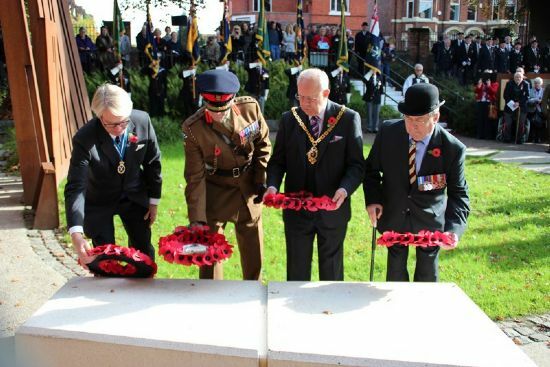 Nevertheless, the main force of the enemy had been driven out and the peril of a collapse of the British defence about the Menin Road had been averted. 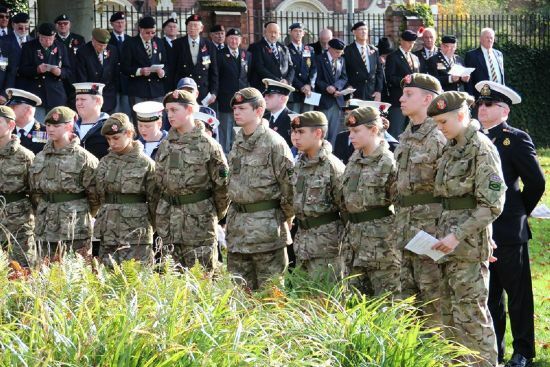 The 2nd Battalion held firm on the ground which they had won. 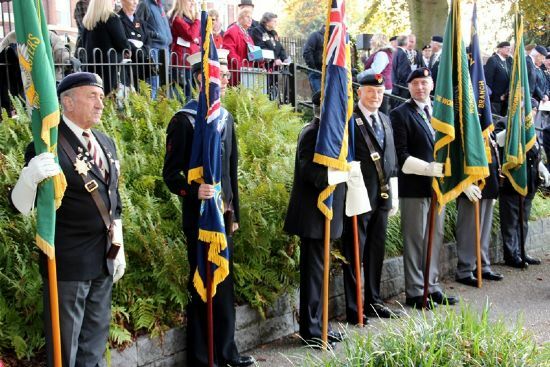 Behind them, General FitzClarence reorganized his troops and made preparation for further resistance. 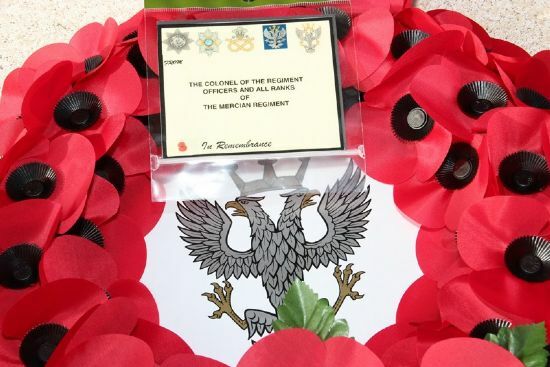 It stands to the perpetual credit of the Regiment that, at the darkest hour of that great battle when others around them were in retreat, our war-worn officers and men went forward unflinching to meet unknown odds and, by their devotion, saved the day. 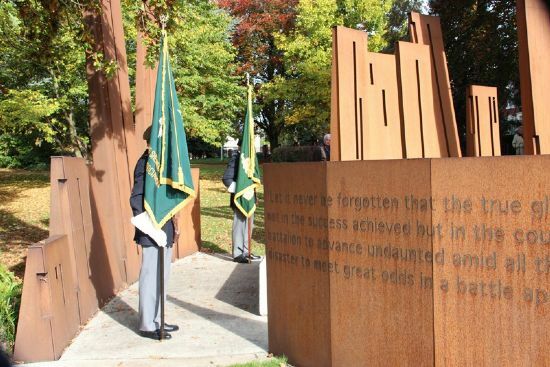 The day’s fighting had cost the 2nd Battalion dearly. 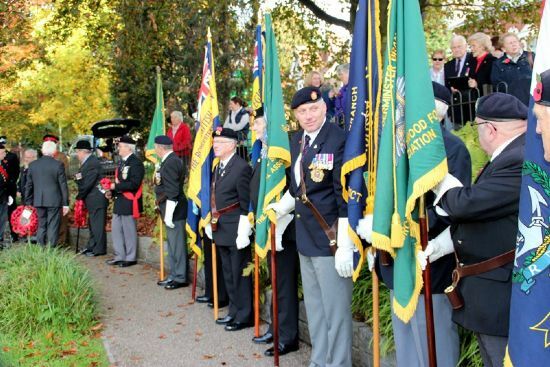 A third of the Battalion’s remaining strength, 187 all ranks, had been killed or wounded. 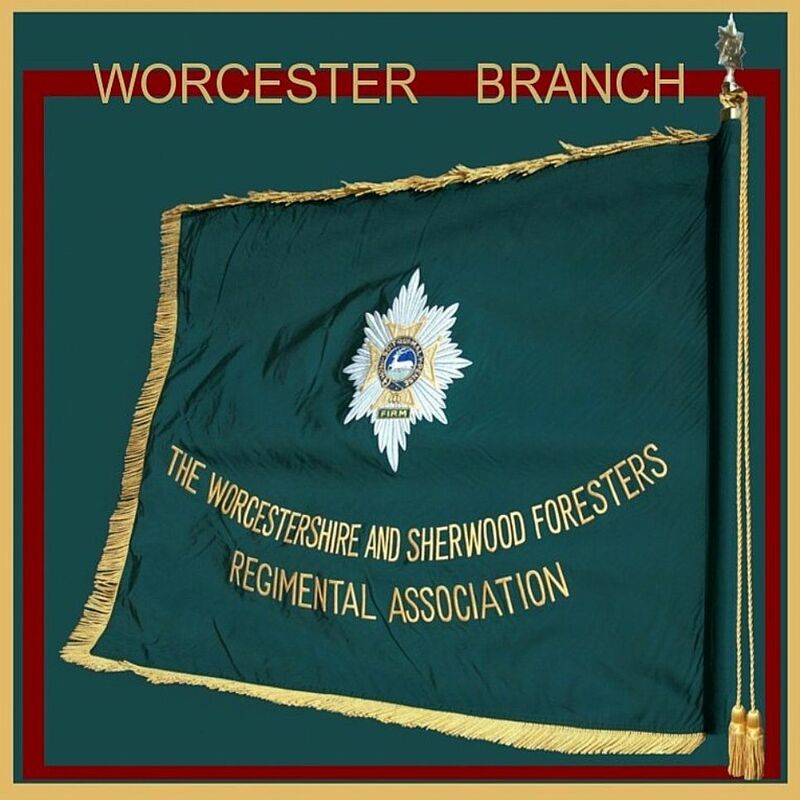 Thanks go to Maurice Smith, Secretary Worcester Branch WFRA for the organising of the Commemoration Service, The Royal British Legion at Claines for use of the premises and to the Ladies of Worcester Branch for their hard work in volunteering to provide the lunch. 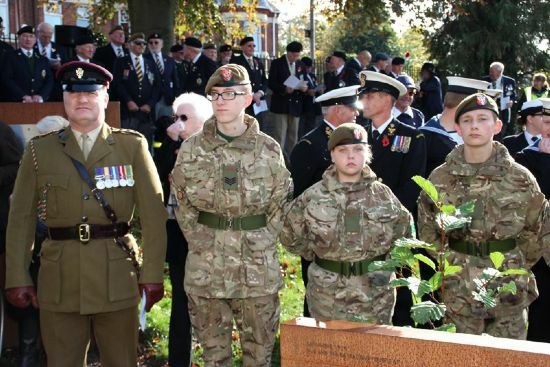 Apologies for any mistakes with names / tiles / rank, for corrections and additions please contact throught the 'Feedback' page. 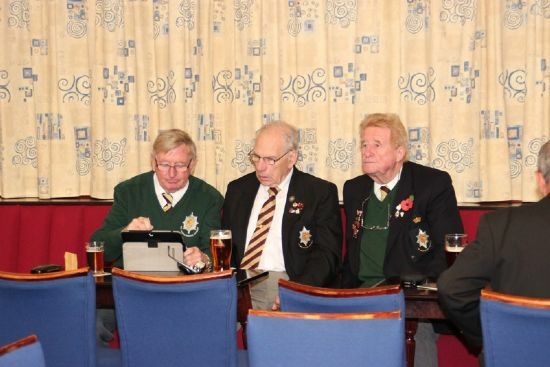 L>, RBL County Deputy, Rudi Heaume Worc WFRA, Brian Turvey Merc Vol Assoc, Mick Salter Kiddy WFRA, RNA Pershore. 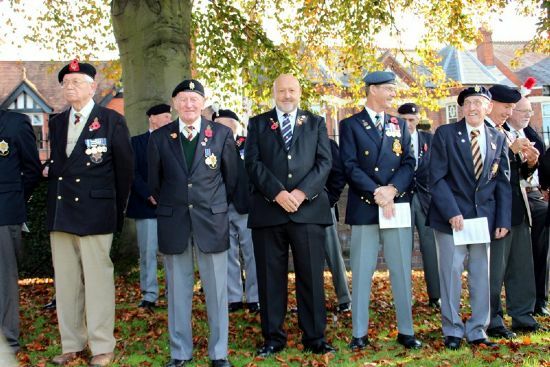 Back,L>, Mick Graham +Bugle, Val Easterlow, John Harris, Martin Stringfellow, Fred Orme. 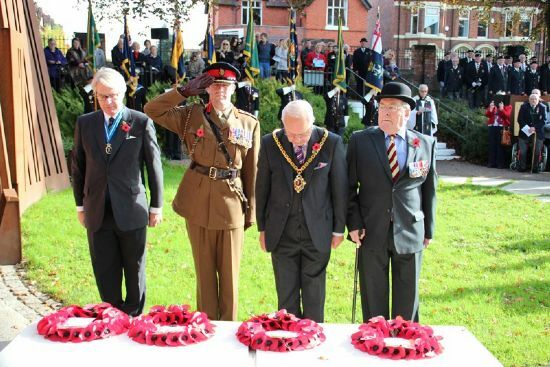 R<, Maurice Smith Sec Worcester WFRA, High Shrrif of Worcs Sir Antony Winnington Bt, Colonel Phil Kimber OBE, Mayor Worcester Councillor Roger Knight, Richard Fox President Worcester Branch WFRA, Dave Waldron County Chairman Worcs RBL, ? 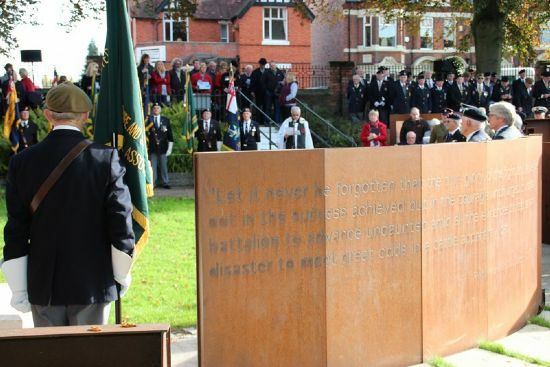 , Inspector Gerrard Smith West Mercia Police Worcester. Graham Bird Kidderminster Merc Vols Assoc. 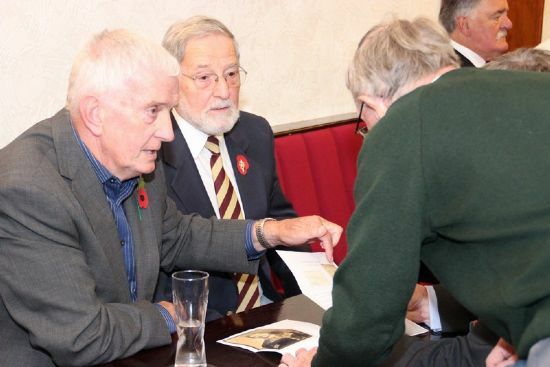 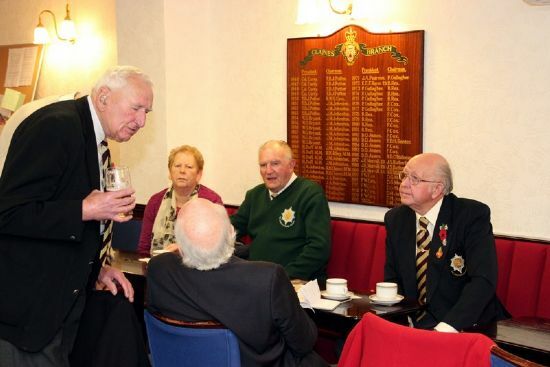 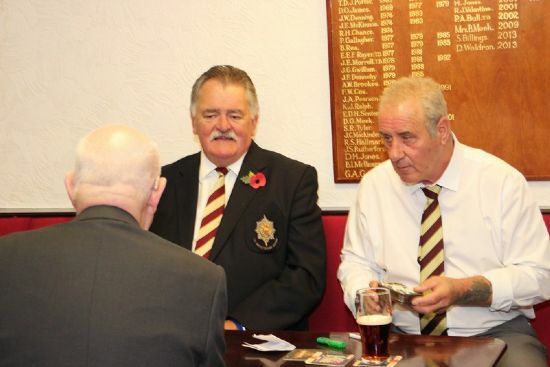 L>, Dave Waldron County Chairman Worcs RBL, ? 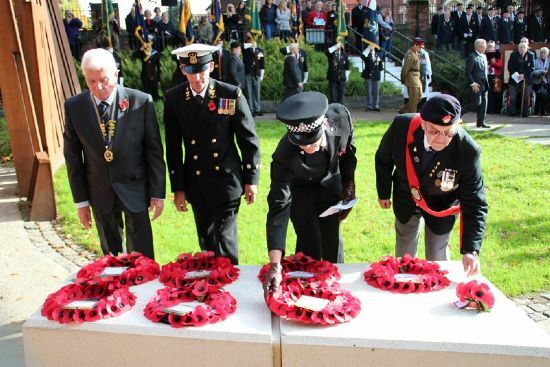 , Inspector Gerrard Smith West Mercia Police Worcester. Graham Bird Kidderminster Mercian Vols Assoc. 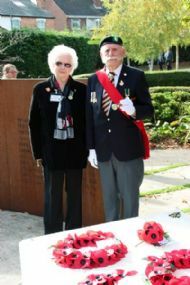 Bottom of photo Sue Imms, Albert Perks,? 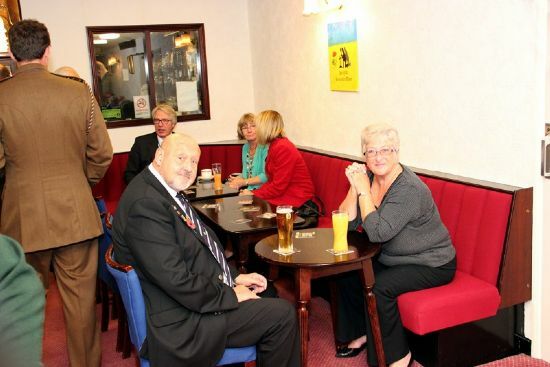 Standing, Martin Stringfellow, Seated L>, Margaret & Jim Barnes, Derek Hill & Back of Peter Dunn.